This electric glass kettle has a super stylish transparent ridged glass body for an ultra-modern look. Adiabatic handle protects your fingers from accidental burns when kettles boiled hot water. It also equipped automatic shut off and boil dry protection system to ensure safety. water level gauge, 360-degree swivel power base, removable/cleanable scale filter, high energy efficient kettle to save you on your bills. 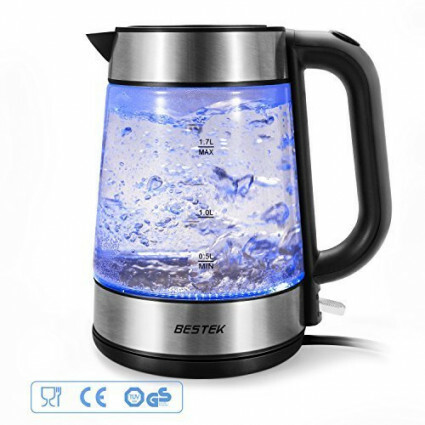 If you need drink a cup of water, The electric glass kettle Boil a 220 ml cup of water for you in just 45 seconds, boil 1.7L water(8 cups) only takes 3-4 minutes.